For the past two years, I have been roasting with the Micro TostaCaffe from cafecoffees.com. I can roast up to 4lbs. with excellent results. 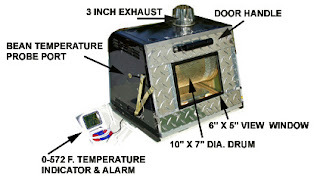 It comes with a puffer module that blows the smoke away from the beans and away from the house. A thermometer is easily used to determine the temperature of the beans. I purchased a Data Acquisition Module that Don Hudson of Cafecoffees developed that allows me to collect data about the roast on my laptop computer with either spreadsheet or graph capabilities. This last piece of equipment has allowed me to repeat favorite roasts more accurately. I prefer this roaster to other excellent roasters on the market because of the large capacity of the drum. It is easy to see the development of the roast both by hearing the cracks (1st and 2nd crack), by the color, and by the smell. Before I attempt to duplicate a favorite roast, I examine my meticulous notes. Coffee roasting combines both science and art. Each roasting batch has different flavor potentials depending on the temperature- the speed at which it reaches that temperature and the duration of roast at that temperature. If the beans are roasted light, I am sometimes surprised at the complexity of the cup. If the beans are roasted towards full city, the beans now have a different flavor profile. The length of time that the beans degas (release CO2) changes the bouquet (smell of freshly roasted beans) and the aroma (the smell of the brewed coffee). Sometimes coffee beans are best if consumed within 3 days. Sometimes, I forget about a roast and let it sit in vacuum sealed bags for 1 week and I am surprised at how mature the coffee smells. By mature, I mean that the coffee has begun to develop new interesting flavor characteristics. Like wine, coffee can remind you of flavors as diverse as tobacco, flowers, fruit, leather, chocolate, caramel, medicinal (bad), or herbs. In fact, coffee has double the amount of flavor characteristics as wine: 1500 to 750. There are a plethora of steps to an outstanding cup of coffee. 1. The science of planting the coffee trees with the optimal levels of nutrients in the soil. 2. The care by which the pickers choose the best batch of beans and separate the defects(moldy, insects, debris, unripe, etc.) from the rest of the batch. 3. Shipping the green beans quickly to the coffee roaster. 4. The art of the coffee roaster that brings the freshest and most interesting flavor profile to the coffee. 5. The science of brewing the coffee at 190-195 degrees Fahrenheit with the proper amount of coffee to make sure that the coffee is neither over or under- extracted. 6. Serving the coffee quickly after brewing. There are over 100 steps from the coffee plant to the coffee cup. Blending different coffees is also an art form. Coffee roasters (people) need to cup their single origin coffees at different degree of roasts to determine what are the characteristics of the particular bean. Beans from Ethiopia, Guatemala, Brazil, Panama, India, Rwanda, Hawaii, Kenya, Costa Rica, Puerto Rico, Sumatra, Indonesia, etc. all have different potential. From one year to the next the quality of the beans from a particular region can increase or decrease. Roasters (people) know what to expect from each of their different beans but there is still a great deal of guesswork and experimentation involved to create an interesting and delicious blend.